There are a number of reasons to consider buying a mattress topper for your current mattress. Perhaps your mattress is aging, but you are not in the market right now to purchase a new one. A mattress topper can revitalize your older mattress by improving the cushioning. On the other hand, you may have recently purchased a new mattress and find that you are not satisfied with the level of firmness. Buying another mattress is probably not an option in this case either. However, a mattress topper can change the firmness to a better fit. Mattress toppers come in a variety of materials and styles that aid in a good night’s rest. How Do You Decide Which Mattress Topper is Best for You? The materials and styles of mattress toppers are varied. And each one comes with its own set of benefits. It is important to point out that mattress toppers are different from mattress pads. 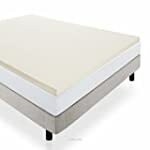 While the primary purpose of a mattress pad is to protect your mattress, mattress toppers are specifically designed for improving your level of comfort. For those needing firmer support, there are options such as memory foam and gel memory foam mattress toppers. To soften a mattress, some of your choices include feather down and down alternative mattress toppers. Down alternative also offers a solution for those who suffer from allergies. Some mattress toppers can cool you down at night, and others offer a close fit that conforms to the body. For those suffering from back pain, certain kinds of mattress toppers can provide support that may help reduce the pain. This guide provides you with information on the many types of mattress toppers that are available. These are the most popular mattress toppers because they are very effective in improving the comfort of the mattress. The material is hypoallergenic and made of a synthetic foam created by NASA for astronauts. It conforms well to the body and can soothe aches and pains. These mattress toppers come in a variety of thicknesses that range from one to four inches. Their density ranges from three pounds to more than five pounds. The thickness and density both impact how firm or soft the mattress topper will be. With such a wide range of choices, it is easy to find one that is the right fit. Memory foam mattress toppers typically last three to four years with regular use. Some customers have said that these toppers have an initial odor, but it soon fades. Memory foam also holds heat and may not be a good fit for someone who gets hot at night. 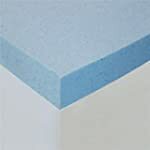 While very similar to memory foam in its ability to conform to the body, the gel memory foam mattress toppers have an added layer of cooling gel. This gel helps to keep you about 30% cooler at night than the memory foam. This is a very good fit for those who wake up in the middle of the night feeling hot. 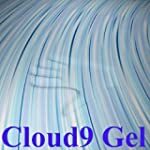 The gel is a solid material that has cooling properties and also provides an extra layer of support. These mattress toppers have the highest density rating of six. Latex mattress toppers are hypoallergenic and are usually made out of either natural or a synthetic blend material. Of the two, the all-natural toppers are typically more expensive. They come in varying levels of thickness making it possible to simply fine tune your bed or drastically change the comfort level. 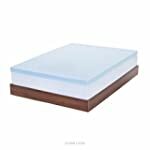 Latex mattress toppers are very durable and can conform to the body and significantly reduce back pain. Of the different mattress toppers, these are the most expensive and and they also can have an initial odor that eventually fades. Feather Down Mattress Toppers, sometimes called featherbeds, are made of the feathers from waterfowl such as ducks and geese. A well-made one encases the feathers in a down-proof cotton cover to prevent the feathers from poking through. These mattress toppers are very effective at softening a firm bed. They are very light and easy to handle, and generally inexpensive compared to other types of mattress toppers. They are also good for providing warmth in cold weather. 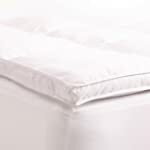 A feather down mattress topper does require regular fluffing and shaking to prevent lumpiness. Down alternative mattress toppers are also called fiberbeds. These are a popular choice for a number of reasons. They are affordable and help to soften a mattress that is too firm. These mattress toppers provide the look and warmth of down mattress toppers but are a better choice for those suffering from allergies because they are resistant to dust mites and microbial bacteria. 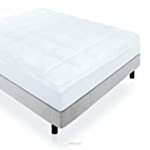 However, this mattress topper will not reduce the amount of motion that you feel if your partner tosses and turns in the night. Wool mattress toppers are very soft. In fact, they can be very effective in softening up a firm mattress. They keep you warm in the winter and absorb moisture to keep you cool in the summer. These mattress toppers are made of all natural materials, typically lamb’s wool, and are resistant to bed bugs and mites. They are durable and easy to spot-clean and some are even machine washable. The price of wool mattresses toppers is in the average range. While they do a good job softening a mattress, these toppers do not provide much relief for those who suffer from joint and back pain. Buying a mattress topper is a money-saving way to bring an old mattress back to life, or even make adjustments to one that was recently purchased. Studies show that 85% of all consumers who buy them are satisfied with their purchase. Each material and style that is available caters to a different set of needs. These needs can range from wanting your mattress to feel firmer or softer, warmer or cooler, or just a desire for more cushioning. While the price range can vary greatly depending on what mattress topper you choose, it is still significantly less costly than replacing your current mattress. The best way to decide which one to choose is to decide on what factors will make you the most comfortable and improve your personal quality of rest.